It sounds a little like the plot of a Parks and Recreation episode, if it were set in a Sandy-smashed town: Eileen Downing, an MTA analyst and former resident of Long Beach, distraught by the loss of protective sand dunes on the barrier island where part of her family still lives, turns to Google—one imagines her entering “post-hurricane dune restoration” and “quick solution that doesn’t cost millions”—ultimately finding her way to James Glover, the Parks Department program director in the coastal community of Brazoria, Texas. Glover introduces Downing to his annual Dunes Day, during which local do-gooders bolster their coastline’s natural storm break using decommissioned Christmas trees. “Nothing works better,” he tells Downing, promising to educate her on logistics. Long Beach officials give the go-ahead, the Public Works Department rounds up 1,000 cast-off conifers, and Home Depot chips in another 2,000. Those trees, as of last weekend, are arrayed along two stretches of Long Beach coastline. In this very low-tech storm-protection scheme, nature should take care of the next step. 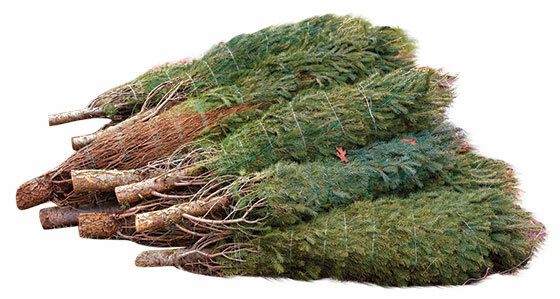 Why dead Christmas trees? For one, they’re free, and their availability coincides with the ideal timing for dune rehab. Placed at the back of a beach, the trees and their needles capture windblown sand, filling out quickly. Tip-to-trunk is a popular orientation, but towns vary their arrangements based on topography and the granularity of their beaches, creating straight lines or snaking patterns, the juxtaposed icons of opposite seasons recalling a surrealist painting. “Having the tree sides face the ocean gives you more surface area, but I’ve seen people dig holes and try to, you know, plant dead trees,” says Tom Herrington, a professor of ocean engineering at Stevens Institute of Technology in Hoboken. As easy as Christmas trees make it to get started, dune-building requires a lot of maintenance over time. Later this year, Long Beach plans to plant beach grass, whose roots will help keep the new dune system in place. “One good thing that can come out of a storm is it makes people feel like the beach is something they need to protect,” says Herrington, but Downing worries that over time it will get harder to rally volunteers. “If we don’t get another hurricane, and I hope to God we don’t, people say, ‘Oh, nothing happened this year,’ and they get lazy,” she says.